This name uses Eastern Slavic naming customs; the patronymic is Mironovichand the family name is Kirov. Sergei Mironovich Kirov [lower-alpha 1] (born Kostrikov; [lower-alpha 2] 27 March [ O.S. 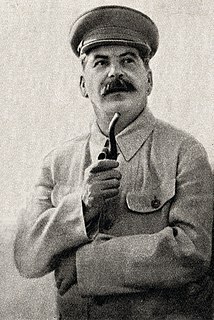 15 March] 1886 – 1 December 1934) was a close, personal friend to Joseph Stalin, and a prominent early Bolshevik leader in the Soviet Union. 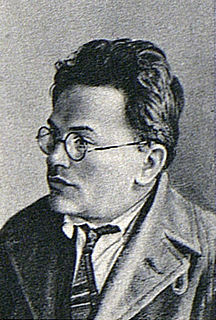 Kirov rose through the Communist Party ranks to become head of the party organisation in Leningrad. Old Bolshevik, also Old Bolshevik Guard or Old Party Guard, became an unofficial designation for those who were members of the Bolshevik party before the Russian Revolution of 1917. On 1 December 1934, Kirov was shot and killed by a gunman at his offices in the Smolny Institute. There is a widespread belief that Joseph Stalin and elements of the NKVD were behind Kirov's assassination, but evidence for this claim remains lacking. Kirov's death was later used as a pretext for Stalin's escalation of repression against dissident elements of the Party, and disarming of the Party (every Party member was issued a revolver up to that time, when Stalin had them all taken away), culminating in the Great Purge of the late 1930s in which many of the Old Bolsheviks were arrested, expelled from the party, and executed. Complicity in Kirov's assassination was a common charge to which the accused confessed in the show trials of the period. The Smolny Institute is a Palladian edifice in St Petersburg that has played a major part in the history of Russia. Political repression is the persecution of an individual or group within society for political reasons, particularly for the purpose of restricting or preventing their ability to take part in the political life of a society thereby reducing their standing among their fellow citizens. Kirov is a city and the administrative center of Kirov Oblast, Russia, located on the Vyatka River. As of the 2010 Census, its population was 473,695. 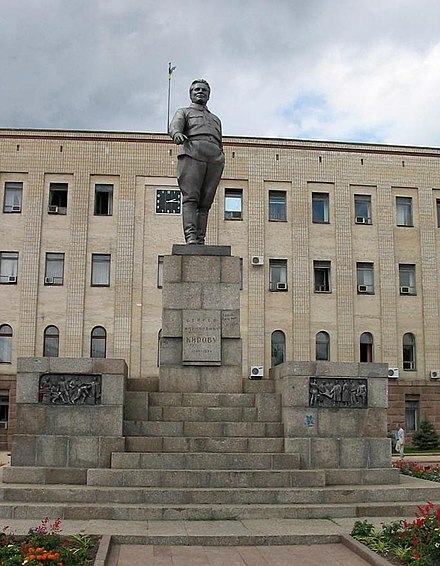 Kropyvnytskyi is a city in central Ukraine on the Inhul river, and is the administrative center of the Kirovohrad Oblast. Population: 232 052 (2015 est.). Kirovsk is the name of several inhabited localities in Russia. Urzhum is a town and the administrative center of Urzhumsky District in Kirov Oblast, Russia, located on the left bank of the Urzhumka River about 10 kilometers (6.2 mi) from its confluence with the Vyatka River. Population: 10,213 (2010 Census); 11,514 (2002 Census); 12,101 (1989 Census). Vyatka Governorate was a governorate of the Russian Empire and Russian SFSR, with its capital in city Vyatka, from 1796 to 1929. In the governorate’s area were situated most parts of modern Kirov Oblast and Udmurt Republic. Kazan is the capital and largest city of the Republic of Tatarstan, Russia. With a population of 1,243,500, it is the sixth most populous city in Russia. Kazan is one of the largest religious, economic, political, scientific, educational, cultural and sports centers in Russia. Kazan lies at the confluence of the Volga and Kazanka Rivers in European Russia, about 715 kilometres (444 mi) east from Moscow. The Kazan Kremlin is a World Heritage Site. Tomsk is a city and the administrative center of Tomsk Oblast in Russia, located on the Tom River. The city's population was 524,669 (2010 Census); 487,838 (2002 Census); 501,963 (1989 Census). Kirov took part in the 1905 Russian Revolution and was arrested and later released. He joined with the Bolsheviks soon after being released from prison. In 1906, Kirov was arrested once again, but this time jailed for over three years, charged with printing illegal literature. Soon after his release, he again took part in revolutionary activity. Once again being arrested for printing illegal literature, after a year of custody, Kostrikov moved to the Caucasus, where he stayed until the abdication of Tsar Nicholas II. In 1921, he became manager of the Azerbaijan party organisation. Kirov was a loyal supporter of Joseph Stalin, and in 1926 he was rewarded with the command of the Leningrad party organisation. At the 17th Congress of the All-Union Communist Party (Bolsheviks), in 1934, Kirov delivered the speech called "The Speech of Comrade Stalin Is the Program of Our Party", which refers to Stalin's speech delivered at the Congress earlier. Kirov praised Stalin for everything he did since the death of Vladimir Lenin. Moreover, he personally named and ridiculed Nikolai Bukharin, Alexei Rykov and Mikhail Tomsky. Bukharin and Rykov were tried in the show trial called The Trial of the Twenty-One. Tomsky committed suicide expecting the arrest. 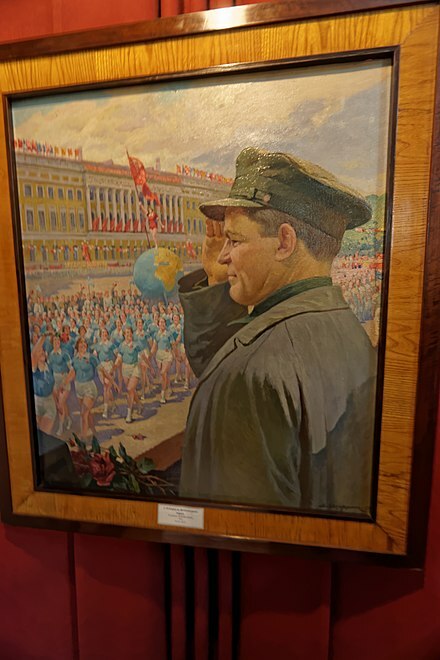 The Sergei Kirov Museum  maintains that the circumstances of Kirov's death "remain unknown to this day." There are no doubts on the aftermath, however: "the bloodiest round of Stalin's terror and repression." After Kirov's death, Stalin called for swift punishment of the traitors and those found negligent in Kirov's death. Nikolayev was tried alone and secretly by Vasili Ulrikh, Chairman of the Military Collegium of the Supreme Court of the USSR. He was sentenced to death by shooting on 29 December 1934, and the sentence was carried out that very night. Nikolayev's mother, brother, sisters and cousin, and some other people close to him, were arrested and later killed or sent to labour camps. Arrested immediately after the assassination, Nikolayev's wife, Milda Draule, survived her husband by three months before being executed as well. Their infant son (who was named Marx following the Bolshevik naming fashion) was sent into an orphanage. Marx Draule was alive in 2005 when he was officially rehabilitated as a victim of political repressions, and Milda was also found innocent retrospectively. However, Nikolayev was never posthumously acquitted. Other speakers duly rose to condemn the Opposition: "The Central Committee must be pitiless – the Party must be purged... the record of every member must be scrutinised...." No one at the meeting mentioned the initial theory of fascist agents. Later, Stalin even used the Kirov assassination to eliminate the remainder of the Opposition leadership, accusing Grigory Zinoviev, Lev Kamenev, Abram Prigozhin, and others who had stood with Kirov in opposing Stalin (or simply failed to acquiesce to Stalin's views), of being "morally responsible" for Kirov's murder, and therefore guilty of complicity. All were removed from the Party apparatus and given prison sentences. While serving their sentences, the Opposition leaders were charged with new crimes, for which they were sentenced to death and shot. Pospelov subsequently spoke to Dr. Kirchakov and former nurse Trunina, former members of the party, who had been mentioned in a letter by another member of the commission, (Olga Shatunovskaya), as having knowledge of the Kirov murder. Dr. Kirchakov confirmed that he did talk to Shatunovskaya and Trunina about some of the unexplained aspects of the Kirov murder case, and agreed to provide the Commission with a written deposition. He stressed that his statement was based on the testimony of one Comrade Yan Olsky, a former NKVD officer who was demoted after Kirov's murder and transferred to the People's Supply System[ citation needed ]. Kirov was buried in the Kremlin Wall necropolis in a state funeral, with Stalin personally carrying his coffin. In the city of Kirov a speedskating match, the Kirov Prize, was named for him. This match is the oldest annual organised race in speedskating, apart from the World Speed Skating Championships and the European Speed Skating Championships. For many years, a huge statue of Kirov, in granite and bronze, dominated the city of Baku. The monument was erected on a hill in 1939 and was dismantled in January 1992, after Azerbaijan gained its independence. The Kirov class of battlecruisers is named in his honor, though the first-of-class vessel originally named Kirov has since been renamed Admiral Ushakov . Kirov was married to Maria Lvovna Markus (1885 — 1945) from 1911, although they never formally registered their relations. His daughter Yevgenia Kostrikova (1921—1975) was a famous tank company commander and WW2 veteran. The Great Purge or the Great Terror was a campaign of political repression in the Soviet Union which occurred from 1936 to 1938. It involved a large-scale purge of the Communist Party and government officials, repression of wealthy landlords and the Red Army leadership, widespread police surveillance, suspicion of saboteurs, counter-revolutionaries, imprisonment, and arbitrary executions. In Russian historiography, the period of the most intense purge, 1937–1938, is called Yezhovshchina, after Nikolai Yezhov, the head of the Soviet secret police, the NKVD, who was executed a year after the purge. 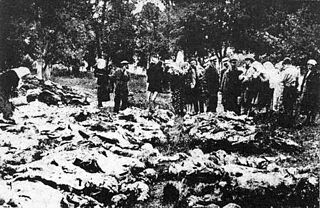 Modern historical studies estimate the total number of deaths due to Stalinist repression in 1937–38 to be between 681,692-1,200,000. Mikhail Ivanovich Kalinin, known familiarly by Soviet citizens as "Kalinych", was a Bolshevik revolutionary and a Soviet politician. He served as head of state of the Russian Soviet Federative Socialist Republic and later of the Soviet Union from 1919 to 1946. From 1926, he was a member of the Politburo of the Communist Party of the Soviet Union. The former East-Prussian city of Königsberg was renamed Kaliningrad after Kalinin. The city of Tver was also known as Kalinin until the end of the Soviet Union in 1990. 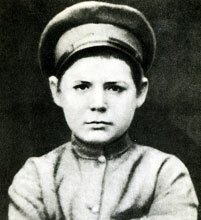 Lev Lvovich Sedov was the first son of the Russian Communist leader Leon Trotsky and his second wife Natalia Sedova. He was born when his father was in prison facing life imprisonment for having participated in the Revolution of 1905. Nikolai Ivanovich Yezhov was a Soviet secret police official under Joseph Stalin who was head of the NKVD from 1936 to 1938, during the most active period of the Great Purge. Leonid Nikolaev was the assassin of Sergei Kirov, the first secretary of the Leningrad branch of the Communist Party. Jānis Rudzutaks was a Bolshevik revolutionary and a Soviet politician. Iona Emmanuilovich Yakir was a Red Army commander and one of the world's major military reformers between World War I and World War II. He was an early and major military victim of the Great Purge, alongside Mikhail Tukhachevsky. He was rehabilitated in 1957 by Nikita Khrushchev. Alexander Grigoryevich Barmin, most commonly "Alexander Barmine," was an officer in the Soviet Army who fled the purges of the Joseph Stalin era for France and then United States, where he served the US government and also testified before congressional committees (including the SISS. Avel Safronovich Yenukidze was a prominent "Old Bolshevik" and, at one point, a member of the Soviet Central Committee in Moscow. In 1932, along with Mikhail Kalinin and Vyacheslav Molotov, Yenukidze co-signed the infamous "Law of Spikelets". John Archibald Getty, III is an American historian and professor at the University of California, Los Angeles, specializing in the History of Russia and History of the Soviet Union. The 17th Congress of the Communist Party of the Soviet Union was held during 26 January – 10 February 1934. The congress was attended by 1,225 delegates with a casting vote and 736 delegates with a consultative vote, representing 1,872,488 party members and 935,298 candidate members. Stanislav Frantsevich Redens was a Soviet secret police official, one of those responsible for conducting mass repressions under Joseph Stalin. Redens was himself executed in 1940, after being arrested at the end of the Great Purge in 1938. The Moscow Trials were a series of show trials held in the Soviet Union at the instigation of Joseph Stalin between 1936 and 1938 against so-called Trotskyists and members of Right Opposition of the Communist Party of the Soviet Union. There were three Moscow Trials: the Case of the Trotskyite-Zinovievite Terrorist Center, the Case of the Anti-Soviet Trotskyist Center, and the Case of the Anti-Soviet "Bloc of Rights and Trotskyites". 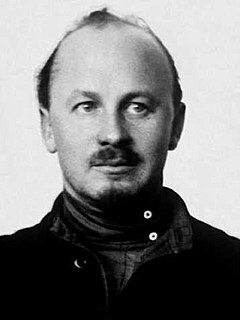 Leonid Zakovsky was an ethnic Latvian NKVD Commissar 1st Class of State Security. Georgy Ivanovich Safarov was a Bolshevik revolutionary and politician who was a participant in the Russian Revolution and the Russian Civil War, and a participant in the executions of the Romanovs in Yekaterinburg and Alapayevsk. Later associated with Grigory Zinoviev's New Opposition and Leon Trotsky's United Opposition, he was purged from the Communist Party, and was later imprisoned in Vorkuta in 1937, after which he served as an NKVD informant. He was ultimately executed on 27 July 1942 by a Special Collegium of the NKVD. He is one of the only victims of Joseph Stalin's purges that was not posthumously rehabilitated or reinstated to the party after his death. ↑ Compare: Smolska, Anna. "Sergey Kirov – Russiapedia Politics and society Prominent Russians". Russiapedia.rt.com. Retrieved 2016-05-19. Sergey Kirov began his political activity in 1904 when he joined the Bolsheviks, a faction of the Russian Social Democratic Labor Party (RSDLP) founded by Vladimir Lenin. At the time the revolutionary movement in Russia was in rapid development despite constant suppression by the Tsarist authorities. ↑ Simon Sebag Montefiore, Stalin: The Court of the Red Tsar (Random House, 2005: ISBN 1-4000-7678-1), p. 112. ↑ Kirov, Sergey (1944). Selected articles and speeches 1918–1934 (Russian). Moscow Russia Valovay 28: OGIZ The State political literature publisher. pp. 106–117, 269–289. ↑ Official page of the Sergei Kirov Museum, retrieved 17 October 2011; the museum is a non-profit organization run by the Russian state. 1 2 Nikita Khrushchev. "Speech to 20th Congress of the C.P.S.U". Marxists.org. Retrieved 2015-12-11. ↑ The other NKVD official may have been Yefim Georgievich Yevdokimov, (1891–1939), a Stalin crony, mass-killing specialist, and architect of the Shakhty purge trials, who continued to lead a secret police team within the NKVD even after technically retiring from the OGPU in 1931. ↑ A. Yakovlev, 'O dekabr'skoi tragedii 1934', Pravda, 28 January 1991, p. 3, cited in J. Arch Getty, 'The Politics of Repression Revisited', in ed., J. Arch Getty and Roberta T. Manning, 'Stalinist Terror New Perspectives', New York, 1993, p. 46. ↑ "Sergei Mironovitch Kirov Poem by Rupert John Cornford – Poem Hunter". Biggart, John. "The Astrakhan Rebellion: An Episode in the Career of Sergey Mironovich Kirov", Slavonic and East European Review , vol. 54, no. 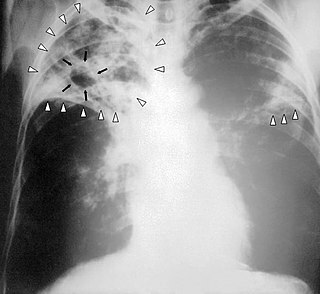 2 (April 1976), pp. 231–247. JSTOR 4207255. Lenoe, Matthew E. (2010). The Kirov Murder and Soviet History (ePub ed.). Yale University Press. ISBN 978-0-300-11236-8. 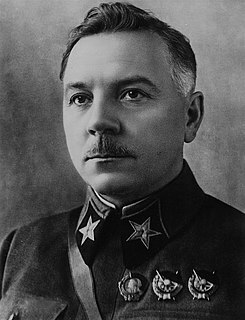 Wikimedia Commons has media related to Sergei Kirov . The son is not responsible for his father or is he?